Posted by Bravado Cooking for Men in Classic Mexican Dishes, Recipes. Women are so easily impressed that it sometimes scares me. I served some warm, toasted pepitas with cocktails last week and a very good-looking woman came up and whispered in my ear, saying “How did you make these – they are absolutely incredible”. It was almost like she had an epiphany or something. Pepitas are so easy to make that it is almost silly – I wonder what she would have said if I’d made something difficult. Actually, at the risk of waxing overly philosophical, pepitas are incredible and for many reasons should replace the ubiquitous peanut that we find in every bar in the U.S. These toasted and salted pumpkin seeds are found throughout Mexico and are almost in the category of a national dish. These are one of the best snacks you will ever taste, and they are very easy to make at home. Although there are many ways to prepare pepitas, roasting raw seeds with a little salt and olive oil is my favorite. You can serve them with cocktails or eat them anytime you want a snack. You can also add them on salads. Or, try one of my breakfast favorites – Greek yogurt, honey and pepitas. You can find raw pumpkin seeds in some stores (Fresh Market and Whole Foods for sure), but I suggest that you locate your local Mexican supermarket and get them there. They will likely be cheaper and you will enjoy the experience if you’ve never been to a “mercado” before. Every community has a latino supermarket and you should locate and try the one near you. Pepitas offer an abundance of nutrients including amino acids, unsaturated fatty acids, and a wealth of minerals such as calcium, potassium, niacin, and phosphorous. They are high in most of the B vitamins, and vitamins C, D, E, and K. They are rich in beta carotene that can be converted into vitamin A as needed by the body, and also rich in the eye protective carotenoid lutein. Snacking on just one handful of pepitas, about one ounce, provides a whopping 9 grams of body building protein, along with manganese, magnesium, phosphorous, iron, copper and zinc. Pepitas are chocked full of monounsaturated oil that has been shown to interrupt the triggering of prostate cell multiplication by DHT, a product of testosterone conversion. The omega-3 fats found in pepitas are also being studied for their potential prostate benefits. The significant amounts of carotenoids in pepitas are of interest to researchers because men with higher amounts of caroteoids in their diets have a lowered risk for prostate enlargement. 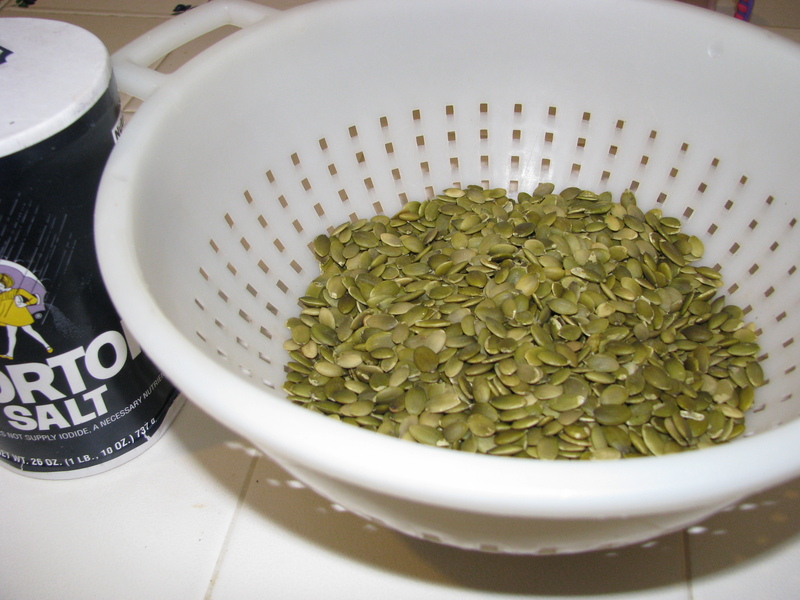 The high zinc content of pumpkin seeds adds to their prostate protective virtues. Another reason for men to eat zinc-rich pepitas is their effect on bone mineral density. Although osteoporosis is usually thought of as a women’s disease, it can affect older men, a group that suffers 30 percent of the hip fractures. 1. Put the pepitas in a colander and rinse with water. Shake well to remove excess water. 2. Put the wet pepitas in a mixing bowl, add the salt and mix well. 3. Warm the skillet over medium-high heat – about the temperature you would use to sauté onions. 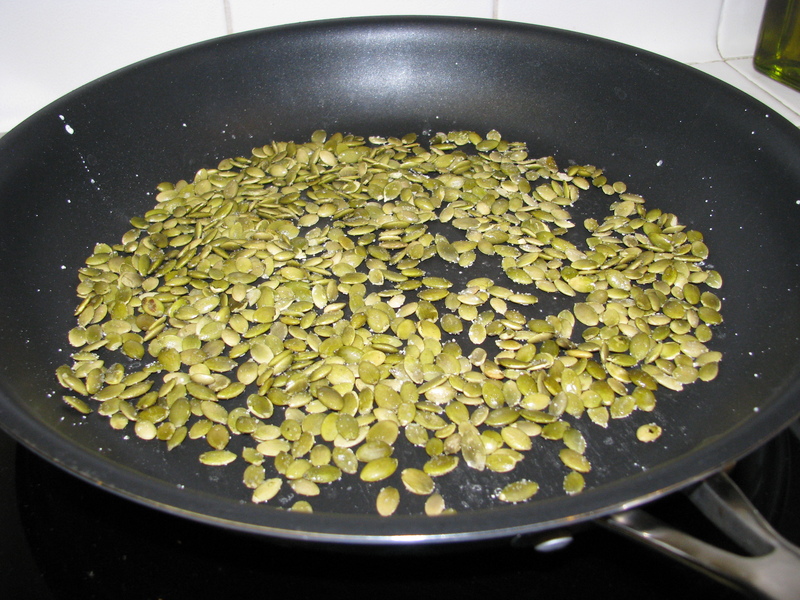 When the skillet is warm, add the pepitas in batches, making sure you only have one layer of seeds. Toast for about three minutes, shaking and stirring frequently. Put finished batches in a serving bowl. The only problem with this dish is that it is easy to burn the seeds during the toasting process. 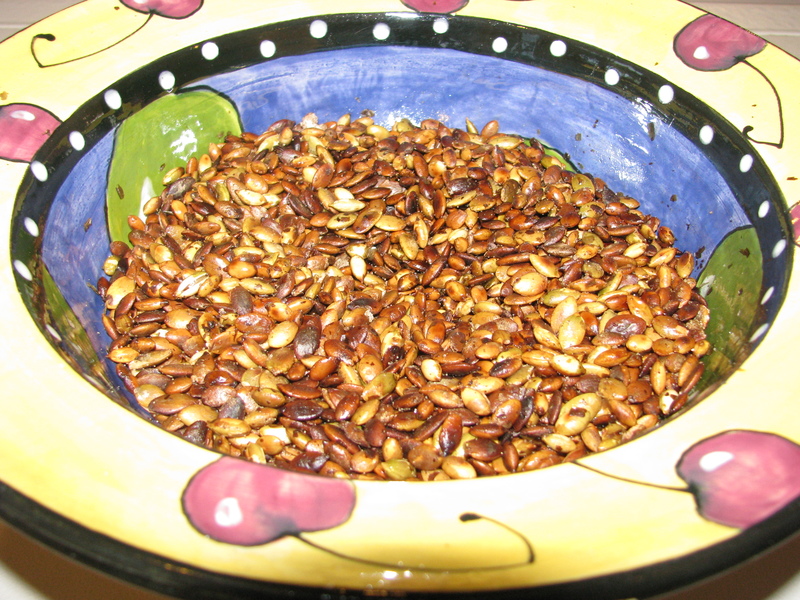 The raw seeds are usually green in color. As they toast, they begin to turn a little yellow. Stop when they get to that point before they get brown. Surprisingly, the salt adheres well to the seeds during this dry toasting process. 4. When finished toasting, add the olive oil and mix well. 5. Serve and enjoy. Store any leftovers in a zip-lock plastic bag.